Visit places you have only dreamed of in an elegant celebration of cities around the world. From Shanghai, Berlin, and Cairo to Seoul, Delhi, and Rome, explore each locale by way of bold illustrations and unlock a miscellany of intriguing facts. Did you know that Prague has the world’s oldest still-working astronomical clock? Or that there are more museums in Mexico City than anywhere else in the world? 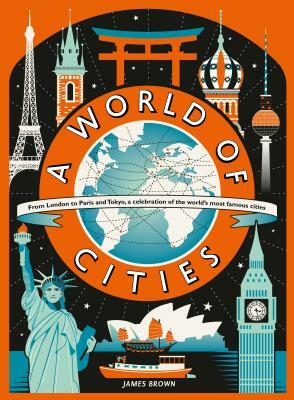 In a follow-up to international bestseller A World of Information, printmaker James Brown has skillfully rendered each city in a stylistic nod to vintage travel posters, while incorporating historical and cultural facts for inquisitive minds to devour. Wander the distinctive cities of the world, all from the comfort of your favorite reading nook. Brown (A World of Information) delivers visually dramatic graphic renderings of 30 cities in screenprints reminiscent of vintage travel posters, with iconic representations of the city’s monuments and symbolic objects...this volume offers evocative visuals that may entice readers to learn more about the destinations.